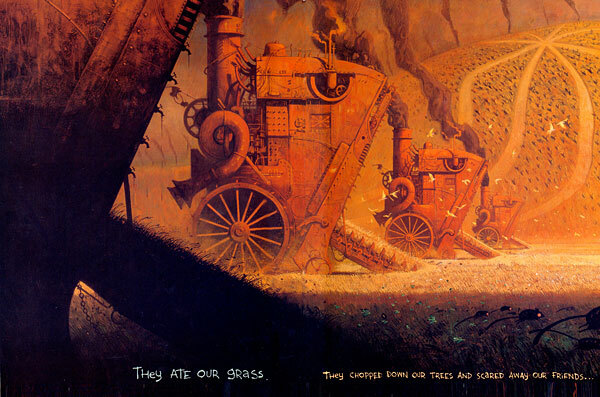 The Rabbits, written by John Marsden and illustrated by Shaun Tan, is a little hard to describe. It's not really a graphic novel but is more than just a picture book. On the surface, the book is about the colonization and industrialization of Australia by Western peoples, but it is also the story of any land that was settled by Europeans in the last two hundred years. On a different level, the book is about the effects of overpopulation and technology on the environment and the loss of natural resources. Although The Rabbits is the winner of The Children's Book Council of Australia's Picture Book of the Year award, the sparsely told story addresses adult and universal issues. The oversize format of the book is the perfect way to showcase Tan's amazing art. The rabbits are not cute bunnies but triangular-shaped creatures that walk on two legs and wear the uniforms of Western cultures. The contrast between the original landscapes and native inhabitants with the introduced species and urban sprawl is unmistakable and unforgettable. I recommend this book for parents who like to discuss political and environmental issues with their children and to anyone who loves beautiful art. The paintings are incredible, and I will turn to this book many times to study the details. 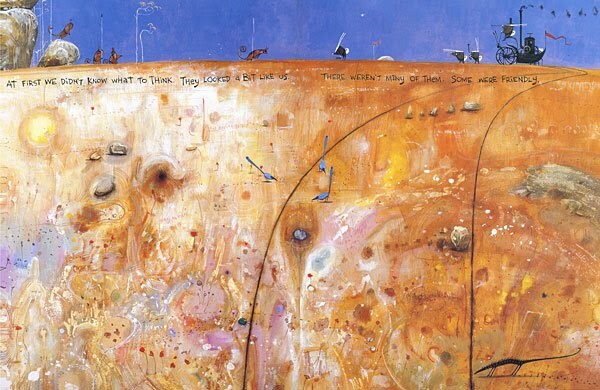 John Marsden and Shaun Tan both have websites where you can learn more about their work. That artwork is stunning. My kids are beyond picture books, but I always like to bring suggestions in to our librarian. Thanks for the highlight! I love Shaun Tan's work. I'll have to request this one too! Wow! You've made me really curious about this book. I think I know the perfect person to recommend it to. Sandy and I are on the same thought/word wave as STUNNING is all I could think of when look at this art work. I recently introduced Shaun Tan's work to my son. He gets lost in the vivid artwork. I cover up the words and ask that he create a story based on what he sees. I need to get him to write down some of what he's come up with. It's pretty amazing! I have heard Shaun Tan's name mentioned a lot recently, but have never seem any of his pictures before. They are amazing! I'll have to try to find some. This is definitely not your usual picture book -- how very interesting! Saw this one, when Chris reviewed it some months back. At the time I hadn't 'read' any Shaun Tan, but I was (and still am) very much an addict of John Marsden's Tomorrow Series. His name alone made me want this one. I am so glad you liked this! I was feeling the pressure. I enjoyed this a lot, and was quite challenged by the political nature of the book, but as usual loved Shaun Tan's art. Jenn, I gave my son The Arrival. There are no words, just illustrations, and asked him to tell me the story that he saw. I read The Arrival over the Readathon and thought it was beautifully done. Now I know how wonderful he is and adding in Marsden only makes it all that more definitive that I'll be grabbing this one to read as well. Lovely illustrations! I'll look for this one! thank you for the recommendation - the art and themes in the book appeal to me.